A busy few months are coming up. 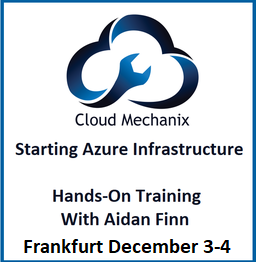 Work on Azure, etc, with MicroWarehouse continues to be extremely busy, Cloud Mechanix continues, and that’s all before some speaking that I’m doing. I’ll be presenting my “Azure PaaS for the Server Engineer” session at this community event. PaaS can be scary for server people – imagine a world with no servers! Not so quick! It turns out that this stuff isn’t so alien and our role is increasing, not shrinking in the dev side of Azure. Join me to learn more. At this conference, I will be representing Altaro. The session I’m doing is a new one called “Solving the Azure Storage Maze”. Azure storage offers a confusing variety of storage options, and figuring out up from down can be mind boggling. My plan is to make this easy for people, boiling it down to a few simple questions/choices. This event is pretty big, but historically it’s been a SharePoint thing so those outside of that community don’t know of it. 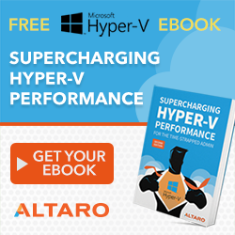 I’ll be talking about getting more performance from your Azure VMs, including planning, implementation, and management. I registered to attend Ignite yesterday. I did not apply for any speaking positions. Speaking at Ignite is a buzz, but I do lots of speaking. The obligations of that are required of speakers in the expo hall are too much for my liking. I’d rather be a normal attendee that makes the most of the Monday-Thursday content. This year, I will be doing lots of Azure, but I’ll also be trying to catch up on Windows Server. Ideally, I’d have a time turner at this conference, but no one has invented that yet. I’m one of the organisers behind this event, sponsored by MicroWarehouse, that will feature expert community speakers (mostly MVPs) from around Europe. An opening keynote will set the scene for 20 breakout sessions across 4 cloud, productivity & security, and Windows Server 2019 & hybrid tracks. And then a closing keynote with Mary Jo Foley and Paul Thurrott will wrap things up. It’s going to be quite the show! Hi Aidan, cheers for the storage maze session at IPExpo – any chance slides will be made available, I foolishly didn’t snap them? Thanks.